Set against the image of a single skyscraper, a lone figure takes in his surroundings. With a megaphone for an ear, a camera for an eye, and a watch keeping time in place of his neck, the man has physically transformed to absorb and record the bustling energy of a booming metropolis. This poster, designed by the Stenberg brothers in 1928 for the film Berlin: Symphony of a Big City, is a striking example of the aesthetic shift that took place in the 1920s and early 1930s in the graphic arts. No longer reliant on realism in illustration, designers throughout Europe embraced the experiments of the avant-garde, maximizing the technological advancements in printing and photography, and exploiting collage to create an innovative graphic style. Brothers Vladimir Augustovich Stenberg (1899–1982) and Georgii Augustovich Stenberg (1900–1933) were Constructivist sculptors in the post-revolutionary Moscow avant-garde. They applied their vision to theater design, ceramics, fashion, and architecture, but their greatest and lasting contribution to this revolutionary aesthetic was one that married the political potential of graphic design with the potent new medium of cinema—the film poster. During a time when illiteracy was commonplace across Russia, cinema was a unique and popular agitational tool. Cinema posters were plastered throughout the streets, with each film’s narrative conveyed in bold images. But the Stenbergs’ posters stand apart for their adoption of cinematic vocabulary—montage, close-ups, distortion—to create playful abstracted works. Their posters captured not only a film’s narrative elements, but also the spirit of cinematic experience. Their use of projection allowed them to incorporate a variety of elements into an unusual but unified representation that seamlessly blended abstracted designs with those sourced from photographic material. By drawing images that recalled the appearance of photographs, they were able to control the quality, tone, and gradation of their images into a cohesive aesthetic. The projection device also enabled them to engage the physical elements of cinema in their design process. To create a poster, they would lay frames from the spool of film directly onto the projector to insert an image from the movie, such as an actor’s face. By projecting the film frames in a similar manner to how they were intended to be shown, the brothers translated the audience’s experience of projected film into drawing, then mass-produced it through lithography. Foreign films that were seen as promoting social content were shown widely in Russian cities. Originally released in 1927, Berlin, Symphony for a Big City was directed by the German filmmaker Walter Ruttmann. It was among the first feature-length films whose primary subject was not a person, but a place. The film narrative relies on the rhythm and structure of following the life of Berlin’s streets for a single day. The Stenbergs often worked under crushing deadlines. It was not unusual for them to see a movie one afternoon and have to finish the poster that day. For Symphony for a Big City, they crafted a composition that ingeniously captured the speed and movement of the life of a city. 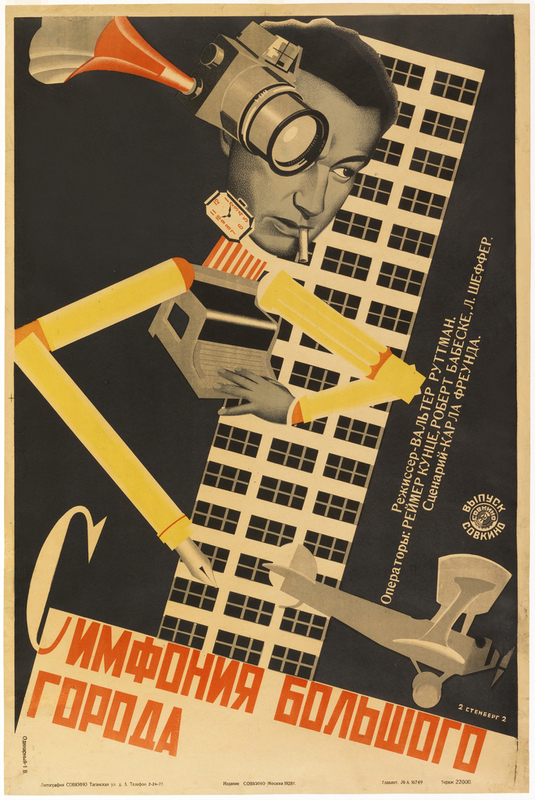 The part-man, part-machine figure at the heart of the poster replicates not a character in the film, but a photomontage by the Bauhaus-trained photographer Umbo (Otto Umbehr), who had worked with Ruttmann as a camera assistant on Berlin, Symphony for a Big City, and produced the original photomontage several years earlier for the cover of Austrian journalist Egon Erwin Kisch’s book Der Rasende Reporter. How the Stenbergs became familiar with Umbo’s photomontage, which features Kisch’s head, remains a mystery. But by using selected elements of the photomontage, they transformed a representation of an individual into an evocative depiction of the overwhelming demands of a modern metropolis. Intriguingly, the skyscraper that stands in for Berlin in the poster bears no resemblance to the buildings in the film, nor to any Moscow building. For the Stenbergs, who had never seen a skyscraper, the simple grid-like structure that forms the background of the poster was an image of futuristic urban fantasy. The Stenbergs were well aware of the challenges of producing a poster that would be noticed. Unlike their contemporaries, who used black type on white backgrounds, they frequently chose a black background with sans-serif lettering in vivid colors. Against the dark, bold red, yellow, and white, and the black-and-white gradient, the poster for Berlin: Symphony for a Big City is cinematic in its own right. Caitlin Condell is Associate Curator and Head of Drawings, Prints & Graphic Design at Cooper Hewitt. This poster is related to objects and themes in the exhibition The Jazz Age: American Style in the 1920s, now on view through August 20, 2017. This essay is excerpted from the book Making Design, available through SHOP Cooper Hewitt. Quoted in Christopher Mount, Stenberg Brothers: Constructing a Revolution in Soviet Design (New York: Museum of Modern Art, 1997), 16.